Being the week upon which Talk Like A Pirate Day falls, I opted to look at a pirate flick for this week’s Netflix Review. 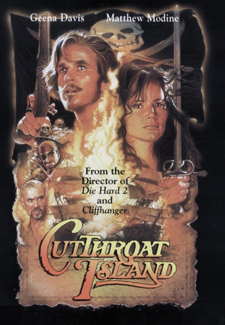 So, grab your cutlass, affix your patch and wooden legs – we’re headed for Cutthroat Island. Directed by Renny Harlin, Cutthroat Island is a movie that was made too early for its time, cursed by the financial woes from a dying studio. But despite its weaknesses, the movie does capture the fun element most remembered in some of the old Errol Flynn classics, and has matured into a movie that audiences can enjoy without taking it too seriously. The plot follows a notorious wanted female pirate named Morgan Adams (Geena Davis) who finds a treasure map tattooed on the scalp of her dead father. The map is one third of the full piece, with one in the hands of Adams’ uncle, and another in the grubby evil mitts of antagonist Dawg Brown (Frank Langella). Taking command of her father’s ship and crew, and taking doctor and linguist William Shaw (Matthew Modine) on board, she leads a crusade to find the treasure of Cutthroat Island. It develops into a race against time as Brown chases Adams down, across the treacherous waters of the Caribbean.